While Dad-o was away in Chicago this past weekend, the boys and I had a jam-packed weekend full of adventure. On Saturday morning, we visited our local fire station, where the dudes got to explore and sit in the pumper truck, tour the station, and see a fireman come down the fire pole (twice!). 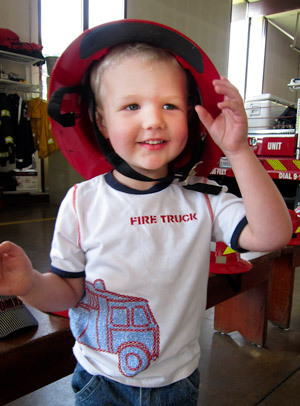 They also tried on some helmets and got to chat with the fire captain and firemen on duty. Afterwards, we headed home to host a playdate at Fort Nack (a.k.a. the new playset) so Finny and Henry's friends and their parents could enjoy the new swings, slide, fort, and trapeze. I think everyone had a ball--there were lots of kids clambering around, Finny was giving them a tour of the newly-dubbed playset-as-fire truck and explaining to the other kids how he would put out fires. There were kids on the sandbox, kids in the fort, kids on the grass, and parents enjoying the gazebo and grass for a picnic lunch. Sunday morning found us "bageling," our traditional Sunday-morning stroll to the neighborhood bagel joint for apple juice and cinnamon raisin bagels with cream cheese. Then we strolled home through Palm Haven with a pitstop at our favorite rock garden, which is filled with interesting small succulent plants and wee garden sculptures. After naps, we headed over to San Jose State University for a free "Pops in the Park" concert, featuring famous movie theme music, another picnic, lots of grass to run around in, *free* ice cream, and more time to hang out with our buddies big and small! It was also our friend Malachy's 3rd birthday (thanks to his mom Shay for hipping us to the concert! ), so the boys also got to enjoy cupcakes and watermelon courtesy of the birthday boy. The guys had an absolute blast and were so worn out that Finny asked to leave the concert early so they could come home and get ready for bed!